Here you have a Hobbyzone HBZ4900 RTF Radio Control Ultra-Micro Electric Airplane !! This plane has a 20.3 inch wingspan and it is 100% Z-Foam Construction. It is 14.3 inches long, it weighs about 1.3 oz, it comes totally built, includes Motor, Receiver, ESC, Servo's, Transmitter, Battery Pack, Charger and is ready to fly !! These exact Kits sell for $149.99 plus tax or shipping at any hobby dealer, and are Well Worth It ~!! Someone will get a bargain here !! This package will include the Complete Airplane With ALL Electronics, Motor, Transmitter, 3.7 Volt 150mah (1) Cell Battery Pack, DC Charger and Original Protective Storage Box !! Here you can open box, charge & install onboard battery pack and you are in flight !! Please go back and check photo's and you will see how nice these airplane's really are !! 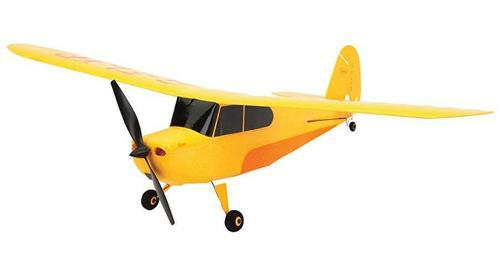 You can't go wrong here when you have this RTF Airplane with a Low Purchase Price Of Only $89.00 !! You will get this Very Nice Yellow Color pattern for Great Visibility, and if you Buy Now you can receive it in just a "few days" !!! So pick this one up for this way below retail price !! OK, so Thank You For Looking and Please Check My Other "BUY IT NOW OFFERS" For More RTF Planes, ARF Planes, Helicopters, Cars, Trucks, Boats, Motors, Parts, Accessories and Many More Great Deals !! Also please buy with confidence and feel free to phone or E-Mail if you have any questions or concerns. Everything you need to Teach Yourself to Fly in one box. NTeach yourself to fly RC airplanes in style with this exciting recreation of Aeronca’s beloved tail wheel airplane. Its small size and lightweight, durable construction let you fly with confidence in spaces as small as your own backyard without having to worry too much about crash damage. And it’s so easy to control you could be flying it like a pro in no time even if you’ve never flown an RC airplane before. on 5/3/2012 What Fun !! Great Plane !! Last year I was hanging out with my friend and I saw an RC F4U Corsair doing tricks above us. I got home and told my dad that I wanted to get one. After research I decided on this one. I got it for my birthday and after it charged I went out and flew it. It was the first time I flew a RC plane. It was very easy. The second time I flew it I did like four loops in a row. I still have it. I crashed it into a tree once and it is still fine! Very durable. The plane is actually orange not yellow. Overall a great plane for everyone.